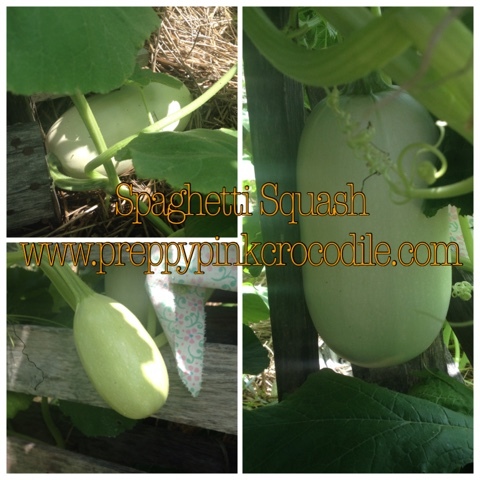 Preppy Pink Crocodile: What's Growing In The Garden? Squash! Lots and lots of winter squash. Last year was the year of the butternut squash. Which was awesome as I love me some butternut. This year, much to my absolute delight and anticipation, seems to be the year of the spaghetti squash! I've never successfully grown spaghetti squash. For one reason or another, luck hasn't been on my side. Until now. And so far, I have five that I feel comfortable saying should get to full size. They're still mostly white but just this week a few have started to take on a yellow tone. Woot woot for growing new things! Do you have anything growing this year for the first time? How many seasons did you give it a go before you saw success? Try and try again, my friends!